Established in 2000, Incite is a strategic research consultancy with offices in London, Singapore, Shanghai, New York, and San Francisco. Specializing in market research, consumer insight, marketing planning, brand consulting, brand planning, innovation strategy, and data analytics, Incite works with clients like McDonald’s, Intel, Avis, and Lenovo, among others. Recently they introduced a new identity designed by London-based Proud Creative. The wordmark subtly reinforces the same message: the dot (or tittle) of the first ‘i’ is a circle, the second ‘i’ a square. In an otherwise san serif word mark, we also introduced a slab serif on the second ‘i’, to give the logo subtle visual intrigue and make it distinctive and ownable. The two different ‘i’ forms play nicely to the wider identity and can be read as a gentle nod towards the two complimentary sides of the business - drawing equally on qualitative and quantitative research techniques. This client falls outside our usual coverage as I’m sure 99.99% of you hadn’t heard of Incite but there are a couple of aspects that are interesting and good for a Review. The first is the loss of the old logo. The lens flare communicated clarity and optimism, turning a simple tittle into a burst of hope, while the beautiful serif typography conveyed professiona… Just messing with you, making sure you are reading. The old logo was a joke. No company, providing strategy/creative/insightful advice should go on about their business using a cheap lens flare logo. Interestingly, the new logo happens to maintain a similar structure from the old logo but with a completely fresh take. At first glance, there is nothing special about the logo, it looks like many other wordmarks. The two selling points are the different “i”s and their respective tittles, the first is a straight “i” with round tittle, the second is a slab “i” with a square tittle. Surprisingly, it works, as the spacing of the letters maintains a good rhythm that allows all the letters to feel in sync. The logo has just enough personality without being the center of attention of the identity. From circle to square, stopping at the different states used as icons on the system that also represent the phases of Incite’s consultative approach. The wordmark is complemented by a set of icons that are the in-between states of a circle transforming into a square through a 3D extrusion rotation. I doubt these are meant to be taken too sriously in terms of the client recognizing that the three-quarter cylinder thing represents “invent” but it’s a playful way to visualize the concept of the identity and tie everything in with the actual business. 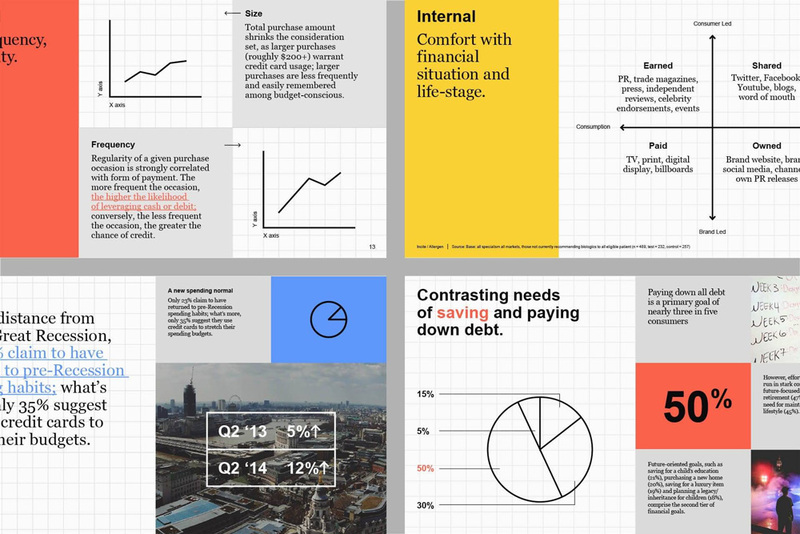 We wanted a visual tool to underpin all the other elements, and so again we drew on the distinctive combination of qualitative and quantitative research techniques in which Incite excel. The graph paper motif blends a nod towards a data-led, or a ‘quant’ approach, with a softness of application; something reminiscent of old school note pads that syncs with the more human-centred approach of qualitative research. Friendly data if you will. 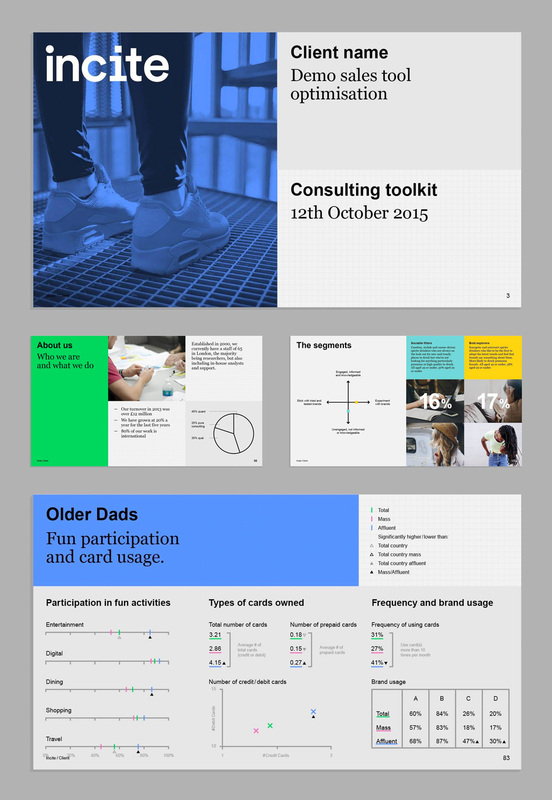 The stationery and materials using the exposed grid feel like they lack a little bit of business seriousness. With the colorful icons they start to look more like they are for a school supply company. 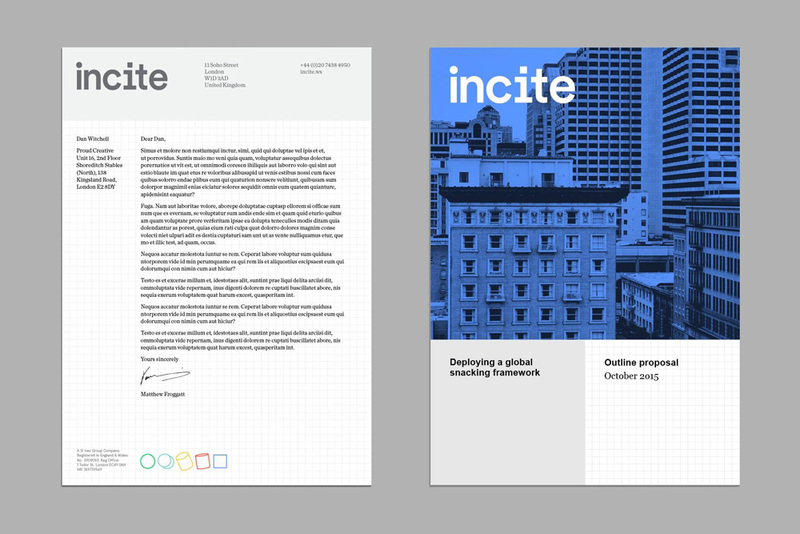 Incite needed a layout which worked across the widest range of formats and could be effectively used by 100 senior consultants with varying levels of skill. So we kept it simple. We built an easy to work with grid. Slides are divided into halves, quarters or thirds; both vertically and horizontally. These became the building blocks for the visual language. The second interest aspect of this identity that’s worth highlighting is that Incite’s practice revolves around making PowerPoint presentations and we all know how many circles of hell it is to design PPT templates for other clients AND/OR be the one responsible for putting them together. The new identity pays special attention to creating a simple system that makes the presentations look almost as if they came out of InDesign. 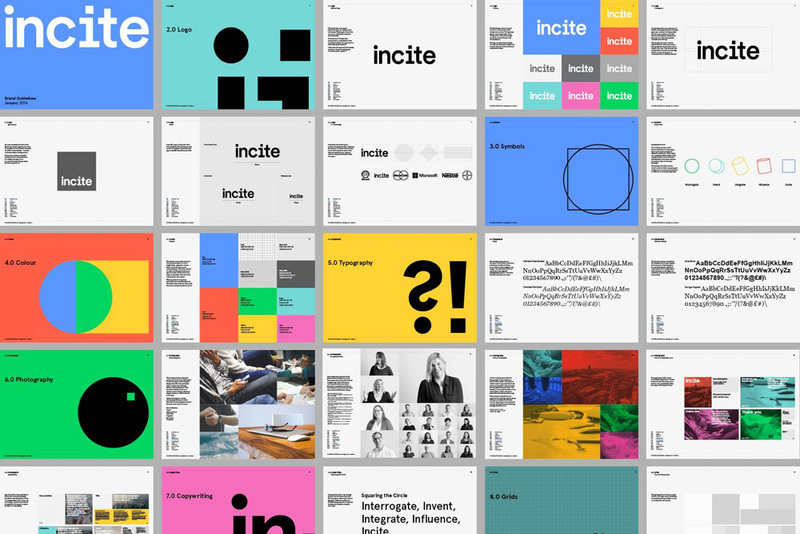 The sample slides above are pretty straightforward but if you’ve seen slides — even from reputable strategy and consulting firms — these have a refreshingly crisp aesthetic that does more for Incite’s brand than the logo. Overall, this is a solid job that makes Incite look like a business that can deliver sharp insight. Established in 2000, Incite is a strategic research consultancy with offices in London, Singapore, Shanghai, New York, and San Francisco. Specializing in market research, consumer insight, marketing planning, brand consulting, brand planning, innovation strategy, and data analytics, Incite works with clients like McDonald's, Intel, Avis, and Lenovo, among others. Recently they introduced a new identity designed by London-based Proud Creative.